Welcome to this episode of LMScast! Today we discuss a course creator’s incredible journey of transformation and financial success with LifterLMS power user Jonathan Farley. Jonathan shares his journey with losing a considerable amount of weight and selling his online course site for almost a half a million dollars. Jonathan had worked in the medical field for most of his adult career. While he was focused on his career his own health fell into disrepair. He weighed around 450 pounds and his health condition was quickly going downhill. Jonathan had a gastric sleeve surgery, and after nine months was down to weighing 175 pounds. During the nine months after his surgery he committed to doing a competitive race every single month. He participated in four Spartan races and two marathons. Jonathan’s largest motivation to really commit to losing the weight was when his son started to look up to him during a kids Spartan race they ran together. Jonathan was involved with a Facebook group supporting people who were looking to lose weight. After receiving several private messages from people looking for more advice from Jonathan he decided to look into the world of online education and found LifterLMS. Jonathan created a membership site with online courses dripping to his students week by week as they were going through the same pre-operative and post-operative stages as Jonathan did. Presales and content marketing is a big deal when selling online courses. Giving people a taste of what they are going to buy before they buy it is a great way to increase conversions. Jonathan actually gave his first users free access for two weeks, then up-sold them to half off his big plan. Jonathan invested about $1,200 into the LifterLMS Infinity Bundle and everything he needed for his site, and down the line when he sold it he was doing around $13,000 per month in revenue, and it sold for $480,000. He is also getting paid to do consulting for the company for the next three and a half years. If you want to get in touch with Jonathan, you can reach out to him by email at [email protected] You can also find him at FarleyProMedia.com where he is helping course creators with video products and website production. Be sure to listen to this episode to learn more about Jonathan’s other amazing online education projects. Chris Badgett: Hello, and welcome back to another episode of LMScast. My name is Chris Badgett, and I’m joined by a special guest, Jonathan Farley. How are you doing Jonathan? Jonathan F: I’m doing great today. Chris Badgett: Jonathan is an amazing member of they LifterLMS community. He’s built a Lifter site, he helps people with Lifter sites, he’s sold a Lifter site. There’s all kinds of neat details of his story that we’re gonna get into. But before we get into your journey with online courses and LifterLMS and technology and online business, this story started with a medical condition you had and a medical decision that you made. Can you tell us about that? Jonathan F: Yeah. I’ve actually worked in the medical field for most of my adult career. I started out as a paramedic and got my nursing license and did all that stuff. But in the process of taking care of people, I kinda stopped taking care of myself. I had ballooned up to about 450 pounds. And then I was going downhill quick kind of thing with my health. I had some heart problems come up. I was actually hospitalized for a heart condition and that was kinda my click bait, my switching moment. My doctor suggested I look into a gastric sleeve procedure. Well, decided to go down that route and went from … when I had the surgery I was about 400 pounds and then I dropped down to 175 in nine months. So, that is an extreme amount of weight, but the other thing is, I don’t have any loose skin, I don’t have any other major side effects that comes with a gastric procedure like that. And so, I always wondered why I was so successful and the reason why was I used my knowledge of medicine with the knowledge of science in the way the body actually works for you, that I wanted to share with other people. So, that’s why I decided to look into the online education realm. Jonathan F: The gastric sleeve is a lot like gastric bypass. A lot of people know what that term means. Gastric sleeve though, it’s actually the first stage of a different surgery. Back a long time ago they used to, and they still do it in some places, but they have a surgery called the Duodenal switch. And the first stage of that is the gastric sleeve. Well, the doctor who created that procedure, it was a two stage surgery. The first stage was the sleeve, the second stage was the full on switch. When they noticed that people were losing a lot of weight with just the sleeve procedure, or it wasn’t called the sleeve back then, so then he created it calling it the sleeve. And basically what the sleeve is, is it turns your stomach from basically a football. So, when food comes in it shifts over to the sides so liquid can go back down the center basically. So, what the sleeve does is it removes 85 percent of the stomach for that pouch. And I firmly believe that it’s not the stomach reduction that makes you lose all this weight. That is at first, but it’s more the hormone changes that the body goes through. So, that’s my basis of my approach. So, the bypass is when they reroute everything and you have malabsorption issues and stuff like that. The sleeve really doesn’t have any of that. You can still have some issues, but it really minimizes that. So, that’s what the sleeve is. So think of your stomach as no longer a football, it’s more like the size of a banana. Chris Badgett: And you said nine months from 400 pounds to a 175. Is that right? Jonathan F: Yeah. So, in nine months I did four Spartan races, which I did the full trifecta, which is the Sprint, Super, Beast and I did the Hurricane Heat. So I have four medals for that. I’ve a plaque on my wall that has this big medallion that has all those on there. And then I also did two marathons and I also did a race every month of that first year. So, I did a competitive race every single month. I don’t recommend this to anybody, but I had the surgery on December 23 and my first five K was three weeks later. Not running, very much walking, but that was my goal, was to do an organized style race every month. So, I had a goal. Chris Badgett: Before getting into the tech. The motivation, I just want to tap into a little bit. Yet you were at this wait and you made a decision and a commitment and then you made a decision to do the surgery and then you made a commitment to transitioning and getting strong and doing these races and everything. What was the driving force behind all that? Where do you draw motivation and commitment and persistence from? Jonathan F: Mainly my family. I have a wonderful son who’s eight years old and now I have a beautiful daughter who’s … I have a eight year old son and a eight month now old daughter, I always wanted to have two kids. I wanted to have a boy and a girl, but we were trying and it just wasn’t working out. Lost all the weight and now we have a beautiful daughter. That was one of the motivation factors that worked out really well. But the other one was, I wasn’t myself anymore. If you knew me in high school at my younger age, I was always fit. I was always running around. So, I kinda lost who I was. But then losing the weight kinda gave me a goal again. But the main thing was getting my family back. And here’s a kind of emotional story for me, but it’s a great story. Is when I finished the first Spartan race, which is a Spartan Sprint. I did one four years before then and I almost thought I was gonna die. I was 350 pounds, I finished it in six hours. Then this fast forward, I lost all the weight. 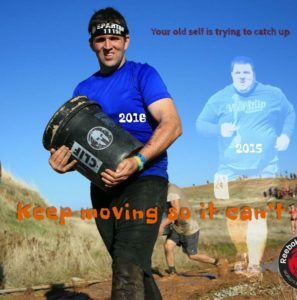 I did this next Spartan race, same location, same race. We arrived late, so I only had one hour and six minutes to complete the race before my son was doing his race, ’cause he was doing the kid’s version of it. So, I was like, okay, I’m just gonna have to miss him doing it. I ran my heart out and I was not challenged, like it wasn’t a challenge. I felt like I could’ve run faster. Finished the race as the kids race was starting. I finished the starting line, heard his race was starting, I was still almost a half mile away from the finish line, so I grabbed my medal, ran all the way to his race, ran his race with him, right next to him. And it’s all on GoPro, so I have all this video of it. He looks to me half way through the race and says, dad I’m just like you now. And that is my motivation moment. When my son actually starts looking up to me. That was my biggest thing. That was my motivation. That’s the kind of stuff that keeps me going. Chris Badgett: Tell us about the moment where … so you ended up wanting to teach people who had, had this kind of surgery, you wanted to give them support and education and you went shopping for technology. Talk about that period of your life. When did you decide to do that and turn that into a business? Jonathan F: Pretty much about three months in. I don’t wanna bash the clinic at all that I went with, ’cause they were wonderful people, but the knowledge they were giving people was wrong. It was not wrong in a sense that they were hurting people, but it was wrong in a sense that, that’s not what they needed to hear. What they needed to hear was not … my teaching concept was, I don’t wanna teach you what to do, like just say, eat this, eat that, eat this. I wanna teach you why you eat stuff. So, do you know why? Most people know that smoking is not good for you, but if you actually tell them why you shouldn’t smoke, they’re more apt not to. But if I just told you it’s not good for you, you may just say, whatever and just do it. So, I teach people why you don’t actually eat this stuff. And I tell people, if you do choose to eat it, this is how you combat that and stuff like that. Chris Badgett: Was that like a forum or something? Or what? Jonathan F: Yeah, it was jus a Facebook group. Chris Badgett: A Facebook group, okay. Jonathan F: Yeah. So, I was just helping these people and they’ll be like, well, I need this help, this help. And everybody would be messaging me privately off the messages like in Facebook Messenger, saying, hey, this is not working for me. The clinic’s saying this, what do I do in this situation? What do I do? What do I do? What do I do? [inaudible 00:10:34] I was like, I can’t be doing this one on one anymore. That’s when I started looking at different online membership sites. Chris Badgett: How did you end up choosing LifterLMS? Why did that one jump out at you as a solution in this space? Jonathan F: Honestly it was Adam from WPCrafter. I watched one of his videos and then I started diving into that. I actually bought everything he suggested, I purchased through that. And then just throughout my research in learning it. I learned that, what’s great about Lifter is it’s your own. It’s like you host everything. You get to say what goes where. You get to put things wherever you want. And that’s why … we can get more into it, but Lifter’s more than just an online learning site for my application. It can do a lot. Just diving into that, I was able to just create a lot of different things. Chris Badgett: I wanted to talk about your first course, like what it was. But before we get into that and keep going down the path. For you, the listener out there, I just wanna zoom out, and take a look at what ended up happening. You ended up selling your LifterLMS site. Can you tell us about that? And then we’ll come back to the story here. Jonathan F: Yeah. So, initial investment to do Lifter, I think everything, the Infinity bundle, everything, probably put about 1200 dollars into the whole package. Fast forward a year and a half later. I realized as one person, I could not hit this niche market as much as other people could. But also my passion had changed. So, I wasn’t as into just this one area. I felt like I was pigeon holing myself, so, somebody reached out to me and offered to purchase the platform. So, we decided to sell the platform for … we can get more into like that dollar figures and stuff, but purchased it for a very big chunk of change that was able for me to pursue more of my dreams in this sector. Chris Badgett: Can you share a little bit, just more detail, about the timeline and the dollars? Chris Badgett: So, like then tie it to when you first decided to … take us to the beginning of when you decided enough was enough, I’m gonna get this surgery and I’m gonna do this thing too, exiting after teaching people how to build or how to deal with this surgery. Chris Badgett: When you mentioned insurance, you mean insurance helps people pay for courses? Jonathan F: Yeah, so, I was able … I actually got this idea from one of the members of the Office Hours. There was a way, if you were pre-qualified for Bariatric surgery, we could charge insurance companies to do the coaching. Have this pre-op and post-op course. I was able to walk into a clinic and say, hey, this won’t charge you anything and won’t charge your patient anything. It’s all built into their insurance plan. So, that was a big selling point. Then I had to create a way to produce vouchers now. Because it wasn’t going through the Lifter payment gateway anymore, ’cause they were just sending me a check. So, they’d send me a check and then I would produce 1000 vouchers. But then I wanted to make it automated, where they could actually purchase through [inaudible 00:15:44] commerce with the integration to purchase the stuff and then the system would automatically kick them out vouchers that worked. So, I had to hire a developer to produce that plug-in for me. Chris Badgett: Awesome, super cool. Chris Badgett: Hold on. I just have a question about [inaudible 00:17:02]. You did a early bird, early adopter discount. Chris Badgett: And at that point, how much of the actual course content had you made? Chris Badgett: So, I just wanted to highlight that for the listeners. You can start, get your validation and just get things rolling, get cashflow turned on. Jonathan F: I literally was … if you know your content and you actually know what you’re doing and you’re not building your content, you know what it is, building the site does not take that long. So, all I had to do, was get out of my own head and realize that people just wanna hear my words. They don’t care about video production, they don’t care about all this stuff. All they wanna do is see the person who they wanna see, give them the knowledge they wanna have. So, I produced the first two weeks, and it took me about three and a half weeks to fully learn the program, like learn the database of Lifter and get the first courses live. So, that was a very quick turnaround. I think a lot of people spin their wheels. Chris Badgett: The main thing is, you’re just helping people. Chris Badgett: You’re giving them the information and the knowledge and the ideas that they need, the tools to be successful after pre-op and post-op, right? Chris Badgett: Do you happen to … I just have a question around, how big was that Facebook group that you were a part of? Do you happen to know the number there? Chris Badgett: [inaudible 00:18:46] a 1000? Only a 1000? Jonathan F: Yeah. So, what I did was, I’ve been in the medical field for a long time, so a lot of people knew me. And I was still working full time doing all this stuff. So, people saw my change. But, what people don’t realize is, a lot of people who are over weight, have family members who are over weight. So, I would get mom and then I’d get dad, grandpa, cousin, uncle, who would buy it. Chris Badgett: So, they’re like affiliates without actually being affiliates. Chris Badgett: And you’re putting this workout into your course. Is that right? Jonathan F: You do the membership for … yeah. Instead of charging 500 dollars, I just charged 25 dollars a month, but you got everything. Because I just wanted everybody to have everything. So, six months into my first launch date, I took down the 500 dollars. I still charge insurance and stuff for just the two courses, but then if they wanted to buy the membership, they still had to buy the … on top of it. So, creating that passive income that people just wanted to pay 25 dollars a month and just get all these workouts. And then I started doing cooking videos. Chris Badgett: Did you organize those? Like the workouts and the cooking videos. Were you using LifterLMS memberships for that? Chris Badgett: Did you structure it into a course? Or is this just content on the side? Or how did you structure it? Jonathan F: I structured everything in courses and in memberships. I created kinda like a P90X kinda style workout, but like a pay per view type thing, but it was all like a membership base. So, you had your membership, they purchased the membership and inside that membership I would create these courses, which was kettle bell 101, kettle bell 102, kettle bell 103. And inside those was ten different workouts. So, kinda built it up like that. So, that was the whole concept of that. Chris Badgett: Were you doing all this kind of, am I correct, by yourself? Chris Badgett: Like this is one person show. Jonathan F: Yeah, exactly. About seven months into it, there was a kid who … his mom came to me and was like, he’s dying. He was 560 pounds. He had started with the clinic at 500 pounds. So, six months after he had started with the clinic he gained 60 more. So, I came to him and within three months … he had to get to 430 pounds to even qualify for the surgery. He started working for me, just working out with me. ‘Cause I just said, hey, if you just show up to my gym, I will train you. That’s all I care about, you just show up. And then, he’s a really good kid, so then I hired him. And then he was doing some of my video editing. Within three months of working with me, he got to have the surgery. So, not only did I fix what the clinic did to him, in less than three months I got him down 80 more. So, in three months he lost over a 130 pounds. Just doing my program. And really it wasn’t like, I’m not doing anything special. I wasn’t producing this world renown diet program that anybody can buy. Really the concept was, you need a scale that can do your body fat percentage and your lean mass percentage. And you need to have a blood sugar monitor. If you have those two things, you always know your numbers. And I won’t get into the concept of how we use those numbers, but that’s all you needed. So, if you had those two things, you were good. And you don’t have to be diabetic to use a blood sugar monitor, it just teaches you what the food does to you. ‘Cause you could eat a hamburger and I could eat a hamburger and then it would affect me differently than you. So, when you learn how the food affects you, you know how to approach things. Chris Badgett: I think one of the lessons here is, and this goes back to a popular entrepreneur on Shark Tank, his name is Daymond John. He created a company or brand called FUBU, which stands for, for us, by us. And so, you’re teaching … you have a for us, by us kind of brand, where you’re teaching from exactly … you’re the person that you’re teaching to. You’re just a little further along in the process.and that’s just such a fundamental thing. Like I don’t know what course I should build, well, you picked the perfect one, where there’s a huge pain point and also a big opportunity to really transform somebody’s life. Jonathan F: Yeah, and some people think, you’re making all this money, why did you sell? I sold because somebody else who … I was starting to lose my drive in the content I was building. And I felt this over … I love the Office Hours, I come to them because I think I can really help people. Chris Badgett: Let me just state for this. You listen to the Podcast, who may not be familiar with Lifter, we have a LifterLMS Office Hours product, which is a stand alone product. It’s also included in our bundle called the Infinity bundle. And that’s a weekly call where people who have it come together for a mastermind to talk about, raise technical issues, strategy issues, marketing issues, look for tool recommendations and generally ask for help and help each other. So, that’s what the Office Hours Jonathan’s referring too is. Jonathan F: Yeah and, honestly, if you’re thinking about buying Lifter, I’ll preach this for you guys, that is honestly what helped build my company up to what it was. But long story, I firmly believe that I was meant to build this thing and then give it to somebody else and have them build it. So, we were able to sell it, think it was like 4000 to 5000 percent profit for, not even counting the revenue that I brought in from the company, it was just selling the platform. And that platform will come out in about six months after he’s done branding it his own. But he is a major surgeon that runs clinics in Mexico and the US. And the reason why he does that is, surgery … like this a life saving procedure, it truly is. If you hear, getting up out of bed for me was almost impossible and I was calling in sick all the time ’cause I couldn’t get up to work. Nine months later I had run two marathons and all this stuff. And I am always a go, go, go guy now. I have no complications. Not everybody is gonna have this much success, but even if you drop your diabetes, you’re successful. But the problem is there’s so many hoops to jump through. So, to want to get an insurance to pay for it was just too much work. So, a lot of people, who already have motivation issues, are saying, I’m not gonna do it. And then the other side of it is, once they get approved it can take six months to nine months to even get you a surgery date. But if you walk in the door of a Mexico clinic, who does a lot of these surgeries and there might be good surgeons, 3000 to 5000 to 7000 dollars [inaudible 00:28:04] on the clinic, you’re out the door. But the problem is, where do you go from there? And a lot of my people were those people. So, they’d find my site and they’d sign up they’d do the pre-op coaching then they’d have the surgery and then they’d do the post-op coaching. So, they never felt alone. Every week they got an email saying, okay, you’re at week two, this is what you can expect. This is what I went through. And you see videos of me in that stage. So, the video of that I did for week ten, was me at week ten. I started video taping myself … like there’s a video of me, actually I’ve never released it, the day of my surgery. Where I was sad. ‘Cause I’m emotional and all this stuff and … because this was a huge thing. That was the day, and I actually call December 23, my re-birthday. I actually celebrate it, because that was the day I decided to take my life back. I went to a surgeon, I didn’t have to have a surgeon, there was nothing broken or anything, I went in there and said, okay, this is me making the decision. I’m deciding this and I wasn’t gonna let myself fail. Chris Badgett: For us, by us, that’s amazing. I get this question sometimes and maybe you can speak to it. If I’m gonna create a course in the health niche and I’m kind of giving health advice or whatever or coaching like you’re talking about. How do you protect yourself from any kinda liability or anything like that? Did you have a strategy around that? Jonathan F: Yeah, so, I actually … every of my courses that were medical based, I actually had a nutritionist right there next to me. And it was my nutritionist from the clinic. She actually left the clinic probably six months after I left or I had my surgery, because of conflicts with them. So, she left … my Bluetooth might die, so, I’m gonna switch to my headset, just a second. These Air pods are great ’til they die. Jonathan F: There. Can you still hear me? Jonathan F: Good, good. Okay, yeah so, I had her and then I also, in the gym I had a physical therapy area downstairs. So, whenever I needed to give medical advice for that, I just had to have a physical therapist there. But then you always have to have a really good medical disclaimer. Chris Badgett: How’d you get yours? Jonathan F: I went to a lawyer and I paid him 500 bucks and he wrote it for me. But the good thing was, the gym I was at already had a waiver there. So, it worked out really well. And then I was also, because I set myself up the right way, I was able to actually charge medicare for a silver and fit through my online learning. People could … since Lifter when you finish a course, it gives you a certification or like a badge. I was able to turn those badges into proof of working out. And silver and fit required that you give proof that the person actually worked out. So, since they had to actually log onto the site and actually had to click a button, saying they did it, that sufficed the requirement to do that. So, people could be doing their gym work at home and then go from there. That was another revenue stream that I had. And I’m actually gonna be starting … I’m gonna be opening up the gym … I’m no longer going to be doing solely Bariatric coaching, but I’m gonna be opening up a fitness area, where it’s mainly gonna be a platform that I can sell a platform to other personal trainers. But I’m still in the process of building that. Chris Badgett: How do you define the difference between a course and coaching? Would you also do any kind of group calls or one on one? Jonathan F: Yeah, I would do … so, Private areas was a huge thing for that, that was the reason why I purchased the Infinity bundle, was for the Private areas. What I would do is, they would sign up for a course and then I would upsell them to a personal coaching. And for that one, I would actually charge 2000 dollars for six months. But that would give them personal contact everyday, once a day with me. And then an actual phone call or a Zoom call once a week for no more than 15 minutes. So, they had to really condense what they wanna talk about in that 15 minutes. And I was really bad at it, I would always stretch it to a half hour, 45. But what that did was, through the Private areas I was able to have a dialog with them. And literally what I would do, like Chris knows, I was always in my car. So, I would literally throw my Iphone on this mounts in the morning and say, hey, I reviewed your data you sent me, this is what I would change. I never gave them specific like, you need to eat this, you need to eat that, because that’s not legal. Chris Badgett: That’s the difference between coaching and a prescription or something. Jonathan F: Yes, exactly. So, what I would say was, with those numbers, if I had those numbers, I would eat a little more avocado, I would eat a little more this, I would eat a little more that. But take your numbers, you have your numbers in front of you. Your fat percentage went up and your lean mass went down and your weight went down, so you didn’t lose weight. That’s what people need … we’re having trouble realizing is, if the scale goes down, but your lean mass went down and your fat mass went up, you gained weight. Like you gained fat. The goal is not weight loss, the goal is fat loss. But I gave them the ability to learn how to do it. And honestly, people they pay for the two, three, four months of coaching, four months into it, they’ll be like, I don’t need you anymore. Chris Badgett: Which is good, that’s a success. Right? Jonathan F: Yes, exactly, exactly. I very ever rarely had somebody rebook a coaching session. But then what I did was, I tried it with the social learning and social learning wasn’t quite there yet, where I needed it to be. So, what I did was, I then started having instructors. Where I sign them up as an instructor, but really they were just a coach. So, they’re always having people who completed my program, I would sign them up as instructors and then when people signed up for their course, which was just a course, but inside that course … when they purchased the course, that created an online profile for them, which created the ability to assign them to a Private area, which then that person than coached them through. So, I gave them a initial course, but that initial course was just how we do our personal coaching. So when they completed that it bumped them into Private areas that I had. So, that’s how I used the model. Chris Badgett: Wow. So, did you do all this while you had a day job or did this become the full time thing? Jonathan F: Within nine months, I had shifted from full time to doing this, from full time work at my hospital job to full time this. And technically I still work there. I’m still on call. And I do pick up shifts to keep my licenses up. But I don’t have to work anymore, well, for that. I just do this. And what I’m doing now is, I’m building sites for other people. I have three people now who I am building their sites for them and running their courses. And I met them through Office Hours. Chris Badgett: Before we get into that. Can you share any general or specifics around the income you were making with the platform and then when you sold it? Like around that. Jonathan F: Yeah, so, the company was bringing in about 13 000 a month. And honestly it was 13 000 of part time work. Once you build it, you’re there, then you just … I would then take a course that was already built, I would duplicate it, change the name, change the permalinks and then re-upload the new content. But there’s better ways of doing that now, but that’s what I had to do back then. So, yeah, that was that. So, I was making a good chunk of change and then as my drive of doing the Bariatric site was going down, the drive to help other people was going up. So, then I noticed I’ll be just ready to switch a little bit. And then sold the company for, the entire deal was about 480 000. I do still, I’m a consultant for him, so I’m getting paid for the next three and a half years to consult with him. And that’s a monthly, so, the first big chunk of it was upfront and then there’s a monthly stipend I get just to help. Chris Badgett: That’s awesome. Well, congratulations on. What an incredible journey. Jonathan F: Yeah. And honestly I could’ve kept it and probably made a lot more money doing it, but we can get into why I decided to do that with these other sites and stuff and what I can see myself doing more. Chris Badgett: The fact that you were able to pull all this off as a one human show, that means you have that rare blend of skills required as teacher, as a technologist, as an entrepreneur, as a community builder. You kinda had all these skills, which is very rare in one person, but it makes you perfect candidate for helping other people, cause they’ll have different blocks in different areas. So, yeah, tell us about the transition to helping other platform creators. Jonathan F: Yeah, so, there’s a guy by the name of Jeff Morris, he came into the Office Hours and he was just asking for help. And we talked about what his dream was, to build this platform and he was asking for help and I said, hey, I’ll help you. And the first thing I did, I didn’t charge him for it. And then really it was … and this is what a lot of creators run into, they get big eyes and then they get people who can do a little bit of the work. So, he built this website, but it was built on old technology and it was built on … yeah, it was just old way of doing things. All I did was … he had this whole site, so, it took him nine months to build, I took his whole site, converted it into a good quality page builder, a good quality theme that was low … themes are going out, themes are going away soon. So I just built this site for him, it took me two days of like four hours each day. And then he was able to have this beautiful site that is full functioning, where he can except payments and actually get his course up and running. So, this guy was spinning his wheels for nine months. And in two days, I had him a full functioning site that could take payment and do everything. So, I see all these people, they have the concept, they’re there, they have the knowledge, but it’s the technical side they don’t know how to do. And his site, DreamSmart academy dot com, and what he’s doing is, he’s helping low impoverished people learn how to motivate themselves and budget and a lot of this community, they get bad advice. They’re taught, hey, if you need to buy a car, go charge it. Well, no, that’s the wrong advice. You should buy a 1000 dollar car and then drive it until the wheels fall off and then buy a 20 000 dollar car ’cause you saved the money. Just little stuff like that, learning the proper way to do things and helping people. Like what’s their why? We’re gonna be launching a campaign next week of like, what’s your why? Where kids, adults, whoever, who can’t afford to take Jeff’s course can take this course and people can actually fund it. So, I built this through Lifter. So, where these kids can come on, they just submit a form, I used Gravity forms, they submit a form and the site does everything. Jeff and myself will get an email that says, hey, you have a submission of a picture, a words and a video. We approve it, make sure it’s good, we hit one button, it’s a post. And then people can come to our site and sponsor kids. So, they’re not giving money to these kids, they’re giving dreams, they’re giving education. That’s gonna launch next Friday. And they’re also gonna have a Podcast and all this stuff going. So, I took my knowledge that I gained from the Bariatric site and now I’m helping kids. And then there’s another site that I’m working on, which is for homeschooling. Helping kids who are in other countries, who are low impoverished, get the right knowledge, so they can build themselves out of where they’re at. So, for me in my heart, I wanna help people. Chris Badgett: Tell us about, you mentioned another variation at the gym or something where you’re gonna help other professionals in the medical [crosstalk 00:42:36]. So, tell us about [crosstalk 00:42:37] trainers. Jonathan F: Yes, yeah. I’m building this space where you have all these trainers around the world. My goal is to do around the world, but right now it’s just local. Where a trainer can come to me and they produce a course and in that course it’s just like their style of working out with home gym equipment or whatever they want and then they’re the instructor. Chris Badgett: And you just remove all the headaches of technology and the video production and everything. Is that right? Jonathan F: Yip, exactly. They can come to the studio and they can just sit down in front of the camera, film it and we take care of everything else. And that site will launch probably in about a month or two. But right now, I’m just trying to find talent. Chris Badgett: That’s cool. And is that a business model where they’re gonna walk away owning the site, or you hold on to the site, keep it up, make sure everything’s, maintenance and everything like that? Or are you not quite there yet? Jonathan F: So, for right now it’s gonna be me owning it, but if they produce a course, they’re gonna get 80 percent of the profit. Chris Badgett: And then about zero percent of the tech. Jonathan F: Exactly. The way I can keep that afloat is, you need to have the knowledge to automate stuff. So, basically I tell them, hey, you’re gonna get this much editing and no more. So, literally we have cameras mounted everywhere. They walk in the door, one button hit, hit record, it’s done. And then we’re switching to a new system that’s gonna be a little more … I talked about it yesterday with the [inaudible 00:44:18], it is a great system where, literally a walk in the door, we can live stream everything. So, it’s just a lot of cool things coming up and you gotta be on top of it and that’s what we’re doing. Chris Badgett: So, do you envision not just people in your local community, but people traveling to you to make these happen? Jonathan F: The cool thing is, I can actually do the switching from my studio when they’re in their living room if their internet connection is good enough. Chris Badgett: The world is your oyster Jonathan. Jonathan F: Yip, yip, yeah. And I don’t want this to be a thing where it’s a bigwig teaching it. It’s the layperson, honestly in my opinion, has more real world knowledge than the bigwigs. Chris Badgett: Than the celebrity. Chris Badgett: ‘Cause your story here on this Podcast, I don’t know that you’re not like a celebrity person or anything. Chris Badgett: But you’re just a regular person who got it, got results and now you help other people do the same. Jonathan F: Yeah. I’ve been on three television shows, like good morning shows, talking about it. I’m gonna be doing the Ironman this year in Kona. Chris Badgett: Hey, congratulations on that. I’m gonna be rooting for you. I might even get my logo on your bike or something. Jonathan F: There you go. So, the crazy thing is, five years ago, I posted that I’m going to be doing an Ironman within five years and that will be November of this year will be the five years from that post. When I posted that I was 400 pounds. So, I don’t know divine intervention … I was just saying, I gotta get my life back, I said five years I’m gonna be doing this. Jonathan F: I purposely put on 25 pounds of muscle, because I know, since I had the surgery, I know how my body will react to tat kinda training. So, I had to put on a little bit more muscle so I can be able to lose the muscle when I’m running that much. It’s a weird concept for people to think about, but I have a really good triathlete coach, who’s walking me through it. And that’s what the concept was. You just gotta get the right people behind you is the kinda thing. Chris Badgett: Got you. Well, I have one more question for you. And for you listening, I hope you stick around for it. Before I ask that though, if anybody watching this wants to get a hold of you or find out more about you, what should they do? Jonathan F: The best way is by email sleeve to fit at Gmail dot com is my kinda generic email. But I’m starting a website called Farley pro media dot com and that’s just gonna be my website building company, where it’s just all about me where I can do your video production, your website production. I’m gonna base it on kind of a education model of teaching you how to build your place and kinda take the heartache out of it. ‘Cause you come in like, I hear all these people and they have all these big ideas, but they’re so bogged down by the technology. So, get somebody in there who actually, not only teaches you about it, but actually is willing to walk you through it kinda thing. Chris Badgett: I call that done with you. Chris Badgett: So, that’s Farley pro media dot com. Check that out. And then just to close it out. If you think back to yourself, some of the people listening to this, whether they’re struggling with their health or they’re struggling to start a business or they don’t like their current situation, they have a vision for a new life. What’s your number one tip for people who are, they can tell it’s gonna be a long road ahead, but what would you say to that person who’s looking at the challenges in front of them? Jonathan F: I think the number one thing you need to do, is get a binder or like a notebook and write everything down and set a schedule and stick to the schedule. And don’t sleep in, set your alarm for a certain time every day, get up at that time, do a morning motivation and then work out in the morning. Get your mind right kinda thing. And I think if you can’t … there’s all these mind melds and stuff like that out there. People’s biggest hurdle is themselves and ’cause they hear all these bigwigs talking about, it’s all about the grind, it’s all about that. You’re working hard, it’s just you’re spinning your wheels, you’re trying to push a boulder up a mountain, where the boulder isn’t what you need to be pushing up the mountain, it’s just the one thing in front of you. Maybe if you stepped aside, let the boulder roll down the hill and then you just walked up it. Get that problem that’s in front of you, figure out how to fix that and then go around it. Does that make sense? Chris Badgett: Yeah, yeah. That’s fantastic. Well, Jonathan, thank you so much for coming on the show. Thanks for being such a valuable member of the LifterLMS community and thanks for sharing your story and inspiring us today. Jonathan F: Yeah. And I’m gonna be doing a lot more stuff with Lifter and is my goal is I’m producing a lot of content. Just getting the knowledge that I’ve created out there. Chris Badgett: Well, thank you so much. Jonathan F: Awesome, yeah, cool.